A few years ago I had a prophetic dream. In the dream I was in a building by the coast, opposite the beach. It was night. I went outside and was taken aback to find a koala sitting on the pavement, alone. The koala was looking up at the sky, stunned. Telepathically I asked him what was the matter, why wasn't he in a tree somewhere. He replied "There was a tree right there .... it's gone!" I looked up at the sky and there was indeed no leaves or branches. To my left was a tree further down the block but it had no leaves for the koala to eat. Here he was, all alone, confused, hungry and lost. Without his favourite tree he couldn't eat or have refuge from predators like dogs and cars. Sadness filled my heart and I picked up the koala in my arms, not knowing what I could do to help, and took him upstairs to my room. Alas, he couldn't stay there either as that was not his place. Back on the street downstairs there were no trees anywhere left for him. I woke up with a terrible pain in my heart, which has never left me. Today I received a self-congratulatory letter from the Department of Health saying how wonderful this development will be for humans and how delighted everyone has been. They went on to explain that the Forest Red Gum at the site for a new health centre (Pottsville HealthOne Centre) was chopped down on March 15. I have been campaigning to try and get this tree protected for the last few months yet quietly, like a ship in the night, the deed was done without anyone even knowing. I feel devastated .... somewhere, right now, is a koala alone in the night confused, disoriented because his favourite tree is gone. And what a magnificent tree it was, around 90 years old. He has no idea what happened. He didn't see the humans chopping it down or understand why they did it. All he knows is that his tree has been there for his whole life, could be used to navigate by, and now it is gone .... is he wondering if he is lost, got his co-ordinates wrong or suffering from delusion? All across Australia many koalas are experiencing this terrible dilemma. The stress of losing a favourite tree can cause koalas to stop eating and breeding, not just become disoriented and confused. Koalas are treated by planners as pawns in a game of chess. They are moved to another area so humans can use their former territory to build another school, hospital or shopping centre for more and more ‘plague’ humans; their trees are felled. But that is OK because there are 'offsets' like compensatory tree plantings (that take 10 years to mature and in the 10 year lifespan of a koala, that is too late). In bush regeneration it is well known that while replanting and regenerating is important, the most important thing is to RETAIN the existing native flora. Is chopping down one koala tree and a few secondary koala trees (i.e. 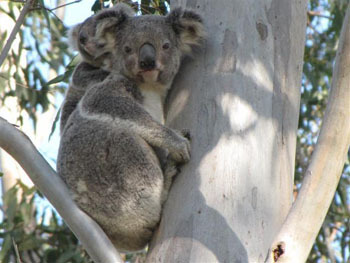 non-food trees but used by koalas just the same) really such a big deal, you may be wondering? When you consider there are less than 144 koalas remaining on Tweed coast and that ecologist Dr Steve Phillips regarded the Forest Red Gum tree as primary koala habitat and 'critical' for the survival of koalas using them, the answer is yes. Koalas are currently being nominated to be listed on the Tweed Coast as Endangered. Not only is this one tree a koala food tree but together with the other two secondary koala trees, Scribbly Gum, they form a corridor. Wildlife corridors are in great jeopardy on the coast due to ongoing housing developments and infrastructure. The Executive Summary from state government said that this area had 'little conservation significance' and there were 'no significant impacts' warranting referral to the EPBC Act (Federal). Tweed Shire council, in spite of a Tree Preservation Order (TPO) on all koala food trees (Tallow Wood, Grey Gum, Swamp Mahogany and Forest Red Gum), gave approval for this tree to be removed. Once the Development Application (DA) has been approved, the TPO can be waived. How convenient. Council took almost a year to decide to accept this DA. Council staff told me that because Dept Health offered $50,000 as an 'offset' towards the construction of a culvert that koalas could use to safely cross the road whenever future road works there took place, council accepted the proposal. Who knows how long it will take to build this culvert or if koalas will use it? One thing for sure, koalas sure won’t be able to eat it. Will there be signposts in koala language directing the lost, confused, disoriented and hungry koalas to use the culvert to cross the road? And for what, if there are no more food trees over there? Isn’t that why they cross roads to get to trees they can eat? Some council ecologists and also councillors themselves felt that koalas can't survive in urban areas due to prevalence of vehicle collisions and dog attacks so therefore it’s not worth saving the tree. Councillor Dot Holdom said “We don't want urban koalas.” Isn't there a way that people could co-exist with koalas, not just tolerate their existence but work to minimise dangers to them? Just over the border on the Gold Coast, the city council has 5 ecologists working on their 'Urban Koala Project' which appears to be working quite well. 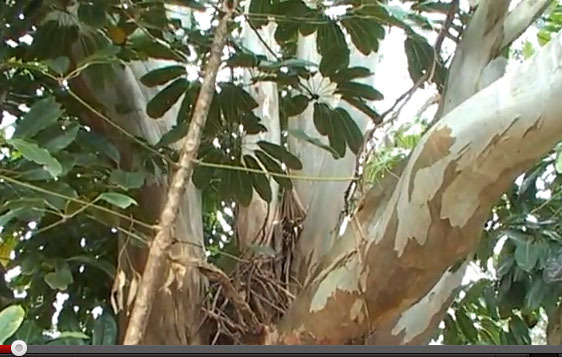 A friend of mine sent me photos taken from his daughter's back verandah in Tugun of koalas resting in backyard trees. Last week I was at someone's house in Currumbin and the people there said they often saw koalas in trees in their back yards - all this in spite of the fact that the area is residential and plagued by dogs and cars, somehow the koalas survive. Other ways to help koalas survive is to mandate cat and dog enclosures in residential areas where koalas still live or traverse, especially in new housing developments such as Kings Forest and Cobaki Lakes. It has already been done by Logan City council in Brisbane LINK. Given how few koalas are left, isn't it time we started to enclose dogs collect data on roadkill hotspots so we know where to put more road signs, speed bumps, speed limits, speed cameras, road overpasses or underpasses with exclusion fencing? Or should we just wait till they all die so we can get on with our lives? What people don’t understand is that we need biodiversity of tree species – some red gum, some scribbly. That is why important to save this tree – there just aren’t many left. Not only did koalas use this forest red gum, but being a winter flowering tree other species used it, some coming from national parks far away. At least Tweed councillor Katie Milne had the sense to request other councillors to write to the Health Dept for a review of the building. It was rejected. You'd think that the building could be redesigned with ecologically sustainable development (ESD) principles in mind so that there was a two story carpark or an undercover carpark so the trees could be left standing with a 3-4 metre corridor for the koalas? Is that asking too much? Apparently. 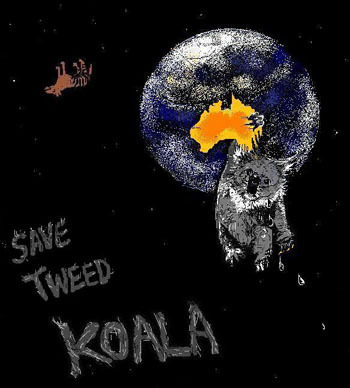 In 5 years if there are no more koalas on the Tweed Coast, we can look back and name those who were responsible for this tragic decision – NSW Dept of Health, Tweed Shire council – plus those who could have made a difference but did nothing, such as the Koala Advisory Group (chaired by Councillor Dot Holdom), Jeff Provest and Justine Elliott (local members who funded Bush Futures, which also did nothing to save this tree). Where was the Environmental Protection Authority or National Parks and Wildlife Service? What about Peter Boyd of Northern Rivers National Heritage? The Northern Rivers Regional Plan 2011 – Vision to 2020 ( published by Regional Development Australia – Northern Rivers Board), our Regional Issues and Priorities APPEAR TO BE first of all Biodiversity followed by human issues (housing, transport, telecommunications, jobs, ageing, infrastructure etc) and including cross-border regional impacts. So why isn’t Peter Boyd looking after our biodiversity? Everyone seems to be asleep at the wheel steering the biodiversity ship straight onto the reef of destruction. Why is biodiversity critically important to us? See http://bluecray.org/advocacy/community-health-and-tweed-coast-koala-populations-13.01.2012 Tree clearing is one of the most threatening processes to biodiversity. According to Captain Paul Watson, this Earth is a spaceship hurtling through space. Humans are the passengers and biodiversity is the life support crew keeping the spaceship working. But the passengers are killing the crew thereby endangering all life on our planet in the future. Sorry to THOSE who need the health centre....??? Sorry to the people with little babies bottle fed, choked up on poisonous food chains and sick with constipations and infections from too many processed formulas, processed foods, poisoned water, air and chemicals and ":DEAD" foods that do not truly nourish. SORRY to the youths who suffer from mental DIS EASE due to an overfeeding of Maccas, soft drinks, media inconsistencies and meaningless lives that cause a fragile brain to shatter into delusion and drug dependencies, ingesting plasticised DEAD foods and living spiritually devoid lives until their whole minds turn to violence, despair and mindless crimes of the insane. I AM NOT SORRY...You are the ones that should be SORRYl!! I think , when i see what the medical world has done to us, with their drugs, procedures and ever evolving complex methodologies that make people mistakenly believe that they are HEALERS... I THINK, when I SEE this cruel killing of koala habitat , I THINK that I see it beckoning the quickest and most succinctly accurate forms of KARMA.... a balance. A balancing that eventuates in every single person involved in profiting and making a living from this clearing of the Pottsville trees .. soon to be losing their OWN homes, their OWN livelihoods and their OWN means of getting about safely, to find food... living food. LATE for redemption,, by these people who govern the TWEED. THERE WAS a knowing... an understanding of the eternity about the action that was taken there. I went to visit that site, looked at the trees, and saw that there was indeed a way to save them, and still create a medical centre there.......the really sick people are not the ones who will need treatment at the Health centre.... the really sick ones are the ones who allowed the tree clearing to occur......the NSW Health Officials, Department of Planning, the Tweed Councillors and the designers of the Centre....YES, these are the sick ones!!! Well, some of them are sick.... some of them are just plain bad.